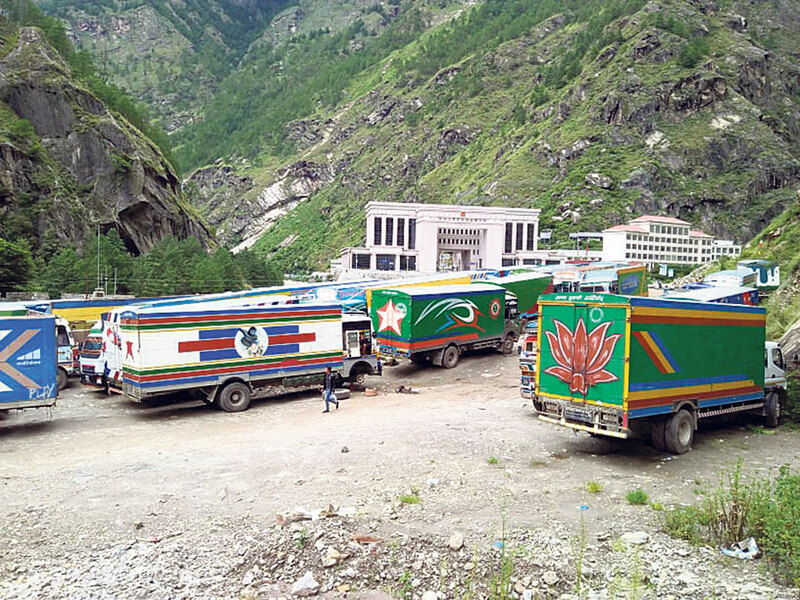 RASUWA, Sept 9: Trade via Rasuwagadhi along the northern border point has now reopened, but traders say they cannot immediately import goods for the upcoming Teej festival from the China. The reason, according to them, is lack of containers to supply goods from Kerung, the nearest market in Tibet. The trade route reopened after a month-long closure due to floods and landslides that damaged the roads leading to Raswuagadhi at several locations. Traders say trading has now started but as they are rushing to resume it all at once, there has been a shortage of containers. Purushottam Paudel, a trader at Rasuwagadhi, informed that goods for Teej are stuck at Kerung, and they have been struggling to find containers to bring them into the city before the festival. The Teej festival falls on Wednesday. "But everybody is trying to bring the goods at once, therefore we are not able to get containers," Paudel said. Traders said the stuck goods for Teej are will vermillion powder, pote (glass bead necklace), bangles, and cosmetic goods. They also said that they were planning to fill the trucks that have reached Kerung with rice to supply to Dolpa. Areas in northern Dolpa that are not connected by any road in the Nepali side, are supplied with goods via Tibetan roads. "The shortage of containers has also soared the rent of the containers up to Rs 160,000 per container from the normal rate of Rs 110,000," Paudel added. "This hike is sure to make the imported goods costlier." Traders have said that although they were not able to import goods for Teej, they were planning to import goods aiming the Dashain and Tihar festivals that fall in October and November. They have already reached Kerung and hired laborers of Rasuwa to transfer goods in the Nepali containers. Customs officials have informed that import of goods will start officially from Monday. Customs officials will also start collecting customs revenue from Monday. Lack of road connectivity to Rasuwagadhi for one month has halted revenue collection though the customs point, which is likely to result in missing of the revenue collection target of Rs 900 million in the month of Bhadra (mid-August to mid-September).